Nyroth was the sixth Factions storyline. It was preceded by Part V: Hextech Revolution. It began on August 20, 2014 and ended on December 23, 2014. Ionia was victorious, and became the League-appointed governor of the Nyrothian mainland. The Factions saga continues with Part VII: Lines in the Sand. 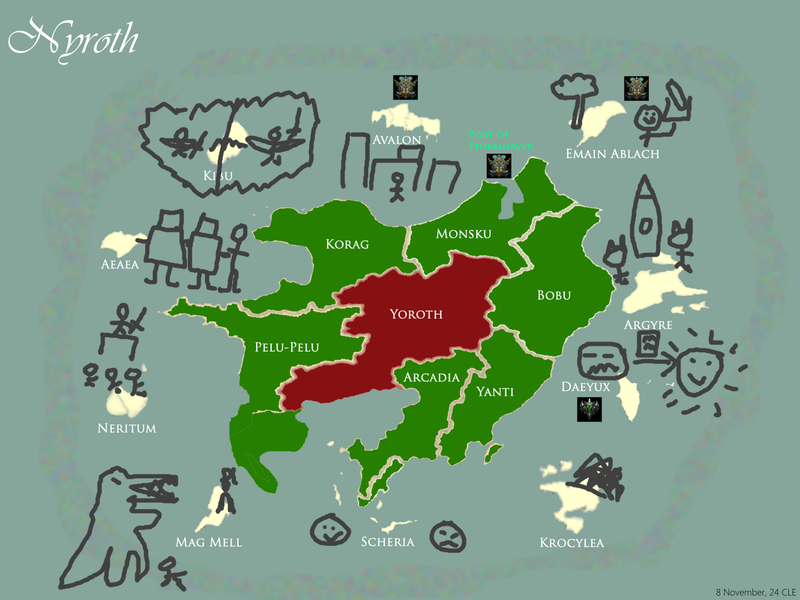 A new continent, Nyroth, has been discovered to the west of Valoran. It has been concealed by a spell-screen of unknown origin for thousands of years, but was spotted from the moon’s surface by yordles who had arrived there in their newly refueled Mothership. 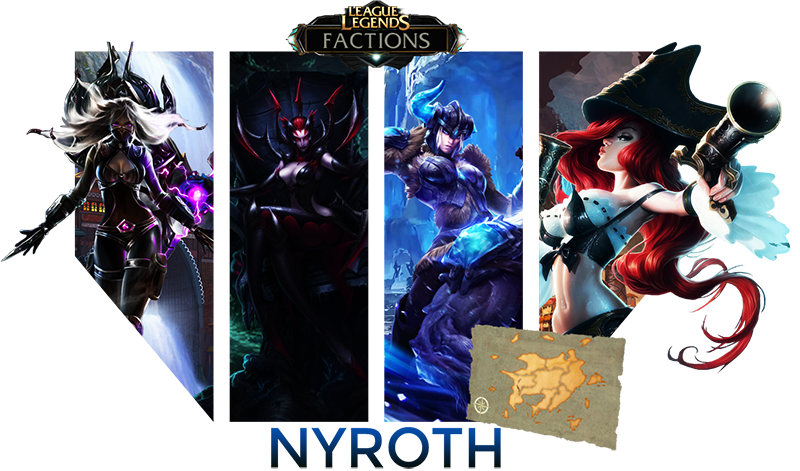 The League of Legends has granted four factions permission to explore this new continent: Bilgewater, Ionia, the Shadow Isles, and the Freljord. Contests upon the Fields of Justice shall resolve conflicts between these factions as they venture forth beyond the spell-screen to the mysterious continent of Nyroth. Bilgewater represents not only seafaring merchants and pirate bands but also maritime civilizations such as the Marai. Fizz and Nami seek magic that could help protect their people from the terrors of the depths, while Gangplank sees an opportunity to sell some stolen wares (if there are living inhabitants) or plunder some ruins (if not). Ionia vows to ensure that Valoran’s delicate balance of power is maintained. It also declares that no civilizations that may be discovered on this island shall face the rapacious plundering and forced colonization that it has itself fought against. The Shadow Isles finds Bilgewater’s greed and Ionia’s idealism equally absurd. The necromancers who rule the Isles do not waste Summoners’ time with such talk: instead, they offer power over life and death, the kind that only they can offer, to any who will take up their cause on the Fields. An image of the continent taken from the moon using a prismographic telescope. The red region is radiating enormous amounts of magical energy. A leyline convergence is suspected as the origin of the islands’ strangely regular arrangement around the mainland. To the west of Valoran, in the midst of the tempestuous Guardian’s Sea, a mysterious continent almost the size of Valoran has remained hidden for thousands of years. The first mention of the new continent is made here, in the “Notable Events” section. The Council recognizes the petitions of Bilgewater, Ionia, and the Shadow Isles. The Freljord is granted entry into the dispute. But who shall lead this divided land? An account of the discovery of Nyroth, with some early speculation about its nature. Bilgewater explores a volcanic island of great saurian creatures. Swain brutally displays the might of Noxus. Bilgewater has magical pixie adventures on an island that is home to a dimensional rift. Ionia discovers a land that also claims devotion to balance. The Shadow Isles and the Freljord are assigned joint responsibility for the island of Krocylea, where two mirror-kingdoms are locked in war, each convinced the other is the personification of the evil within them. Some Krocylea aftermath and other decisions. The factions complete some additional explorations. The Shadow Isles breaks free from Aatrox’s control, and Bilgewater repels their attack on Stormhaven. Factions make their final decisions. The resolution of Lore Event VI. We’re still filling in some of the blanks, even now that the Council has unsealed most of the records of the Nyroth dispute, but here’s a summary version. The Freljord won access to Yoroth, the central region of Nyroth that contained the “mega-nexus” at the center of the leyline convergence. The Shadow Isles launched an all-out attack on the port of Stormhaven, Bilgewater’s headquarters on Nyroth. There was mayhem, there was death, Mr. Chompers the bone dragon tossed a galleon through the port, Gangplank used citrus-infused rum to set zombies on fire, Aatrox taunted Jax and got eaten by a kraken. The Shadow Isles broke free of Aatrox’s influence and fell back. The Frostguard, with Ionia’s help, restored Yoroth’s nexus and made the mainland habitable for Nyrothians again. Ionia ultimately won the dispute, though Bilgewater retained authority over Nyroth’s foreign affairs. The restoration of the Nyrothian nexus network triggered a thaumic surge that carried across the sea to Valoran. This catalyzed the emergence of the Ironspike nexus, and gave Azir enough power to restore the Shuriman capital. Peace has prevailed. Valoran, by and through THE LEAGUE OF LEGENDS, recognizes the sovereignty of the new land of NYROTH, under the protection and guidance of THE SERENE REALM OF IONIA. With regard to foreign affairs, Nyroth has chosen THE MARITIME CONFEDERATION OF BILGEWATER to represent its interests before the League of Legends. A thousand years ago, the reckless violence of the Rune Wars ravaged a wondrous alien land far across the sea, known as Nyroth. Valoran’s runespells corrupted the leyline convergence that created and sustained Nyroth, and destroyed a civilization equal to our own. Millions died in terror. Our discovery of Nyroth has thus revealed a tragic truth, to our everlasting shame: that the fate we ourselves escaped through the foundation of the League came to pass on others. It was our malice that brought this devastation, and Valoran that should have borne it; Valoran that should have burned with wrathful starfire; Valoran that should have been shaken asunder by the surly eruptions of the ground below; Valoran that should have become a ghost-land devoid of sapient life. Historians have often said that the League was founded at the eleventh hour, not a moment too soon. May we never forget that the League was too late! The League was too late to avert catastrophe. Catastrophe came, and it fell upon the blameless. Since the foundation of the League of Legends twenty four years ago, Summoners have turned this terrible magic toward more peaceful ends. Their tireless dedication to the good of Runeterra has enabled them to repair the damage done to Nyroth, that the people of Nyroth might rebuild their cities and reclaim their glorious accomplishments. The Freljord, with the assistance of Ionia, has worked magic equal in magnitude to the battle-spells of the Rune Wars, but bringing life rather than destroying it. The leyline convergence has been restored, and Nyroth is whole once more. The thaumatoxic field that repelled Nyrothians from their ancestral homeland has dissipated, and the mainland is once again habitable to the heirs of Nyroth. Through this act, Valoran does penance for an ancient sin of inhuman proportions. ♦ KROCYLEA shall remain under the direct authority of the Council of the League of Legends, until the damage done by tragic resort to destructive rune magic in contravention of League law may be fully repaired. Let the word of the League be as law, lest all the nations of Valoran arrange themselves against ye. There may be no appeal. We should probably add a lot more of the lore events to this list, considering this page goes up to 3, and after the exploration of Neritum, Argyre Part 2, etc, we made it up to 11 or 12 or so. Edit: Just looked, with Mag Mell that’s 16. Those are about to go up in a massive wave. As soon as I get these island explorations ready to post, I want to get Updates 4 and up revised sufficiently. “Declare for a faction”. I’ve also added another link at the top of the page. not to rush anything, but people REALLY want Signups to open up.